More than 125,000 apps have now been published in the Windows Phone Marketplace and new content is currently being added at the rate of 215 apps per day. At the time of writing, 126,530 apps have been published, of which 113,170 are available for download (live). Of these, 15,822 were added in the last three months and 5,673 were added in the last month. These apps come from just over 30,000 different publishers. The 50,000 app mark was reached on December 27th, 2011, the 60,000 mark on January 22nd, 2012, the 70,000 mark on February 23rd, the 80,000 milestone on March 26th, the 90,000 milestone on April 30th, and the 100,000 mark on May 3rd. The 125,000 mark was reached on October 14th (approximately). There has been a slow down in the rate of apps being added to the Marketplace in the last few months, possibly a result of resources switching to the upcoming Windows Phone 8. Based on previous announcements by Microsoft (e.g. the "official" 100,000 milestone announcement coming a short while after our own) we estimate the "official" app count to be somewhere between our figures for published (126,530) and live (113,170) apps. The differences are due to the exact classification of apps (e.g. Microsoft appears to exclude some unpublished apps, and includes some live-but-not-public apps). 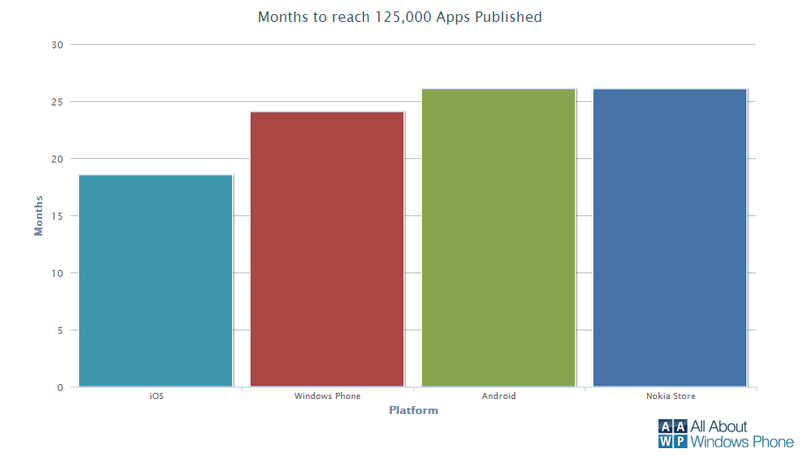 The graph below shows the growth in the total number of apps (content items) published to the Windows Phone Marketplace over the last 24 months. In common with other application stores, the total number of published items is not the same as the number of items available to consumers. 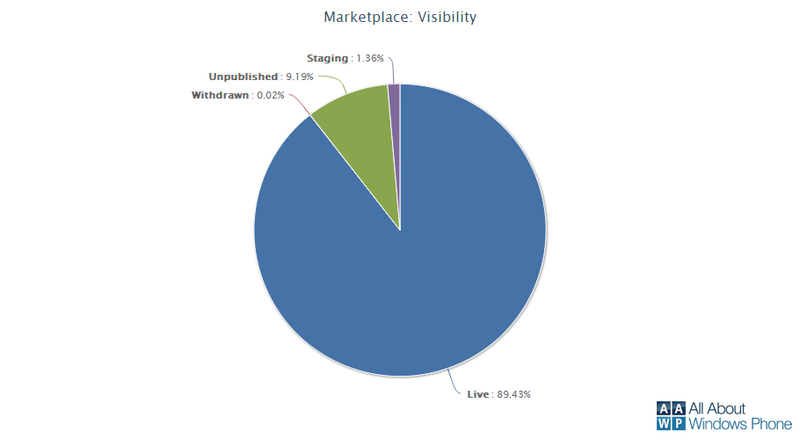 Of the 126,530 items published to the Marketplace, 11,639 are no longer available (withdrawn by Microsoft or unpublished by the developer), a further 1,716 items are in staging (awaiting an update, in beta or not live for some other reason). 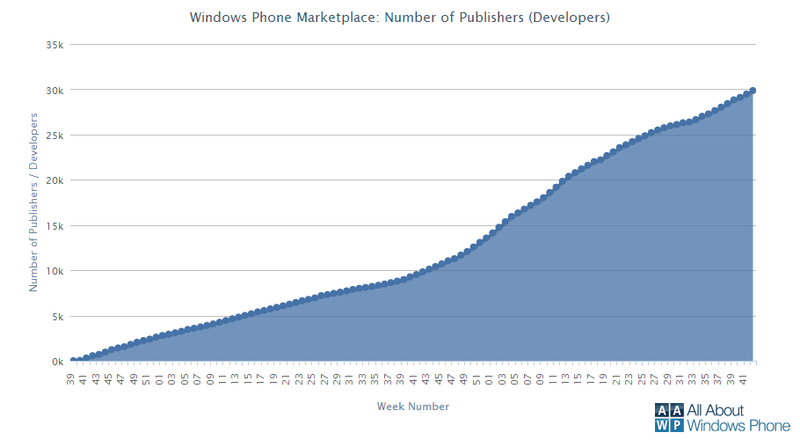 That means there are 113,170 apps currently available for download (live) on the Windows Phone Marketplace. In addition, some apps are only available in select markets. 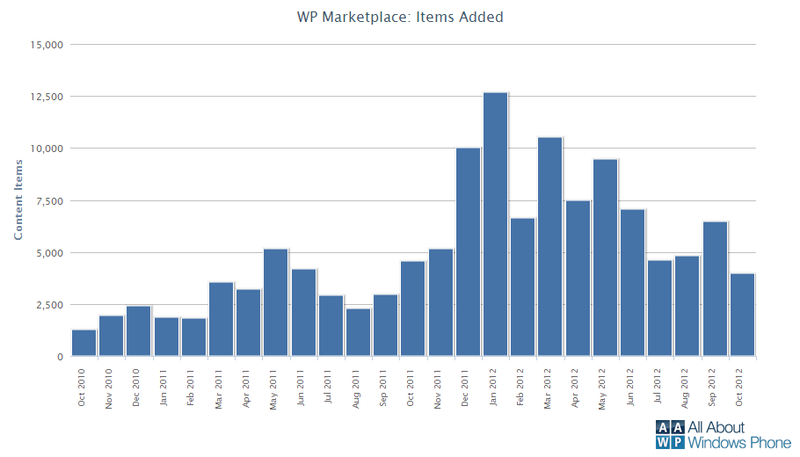 This means the number of available items to a consumer, in a given market, is lower than the number of published items. The current figures for live apps (i.e. fully available for download) are: US (101,517), UK (96,265), France (92,887), Spain (91,224), Italy (90,806), Germany (91,940), Australia (92,670), Russia (75,728), Brazil (65,360) India (92,130) and China (46,094). It's notable that both China and India have enjoyed stronger than average growth since our previous report, perhaps indicative of strong sales of low cost devices, such as the Lumia 610. The graph below shows the number of live apps available in 59 countries. The 5 groupings visible in the chart align, roughly, with the date at which the country went live in the Marketplace. The five groups are Windows Phone launch (October 2010), Mango launch (October 2011), Expansion 3 (January 2012), Expansion 4 (March 2012), and Expansion 5 (April 2012). Some apps are only distributed in a single country. This usually applies to apps that contain region-restricted content or features, are hyper-local (only relevant to one country) or are only available in a single language. 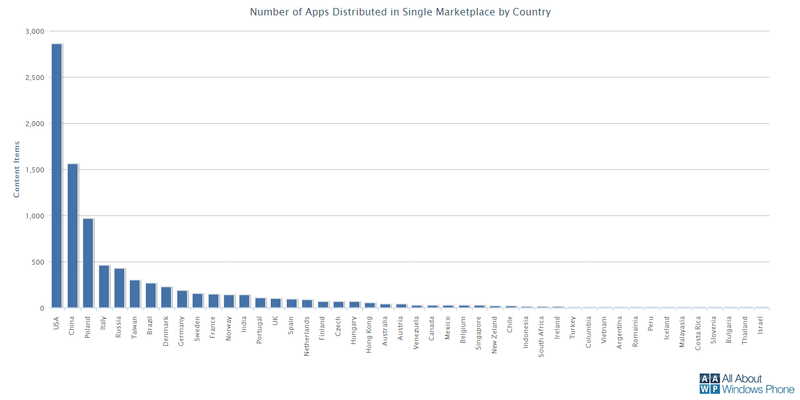 The chart below shows the number of single market distribution apps for each country. As you might expect the US leads the way (2854), with China in second place (1558), indicating a strong "local" app presence. Other apps are distributed in multiple countries, but not all the countries are available in the Marketplace. Developers with such apps may be missing out on potential downloads. The majority of apps are published in English (99,180 of live total). A number of apps are localised into other languages, with German (7,541), French (6,764), Spanish (5,803), Italian (4,477) and Chinese (2,617) being the most common. This represents a surprisingly small proportion of the total number of live apps, but it is an increasing proportion (i.e. 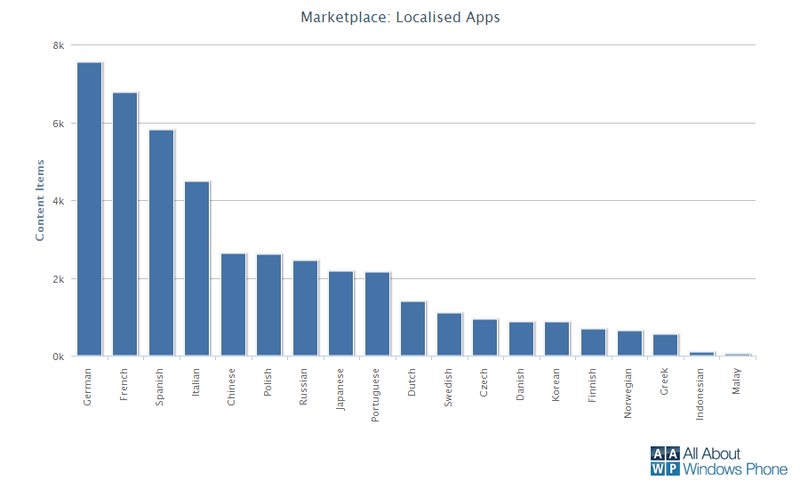 newly released apps are more likely to be localised). Given the importance of local content and the increased likelihood or buying/downloading an app if it's available in your local language, localisation is an area that both Microsoft and developers themselves should be looking at more as the Marketplace continues to grow. One factor that is holding back localisation of apps is that Marketplace guidelines require all app content, including app store descriptions, to be localised before an app is approved (i.e. more expensive and time consuming than just localising key app language). 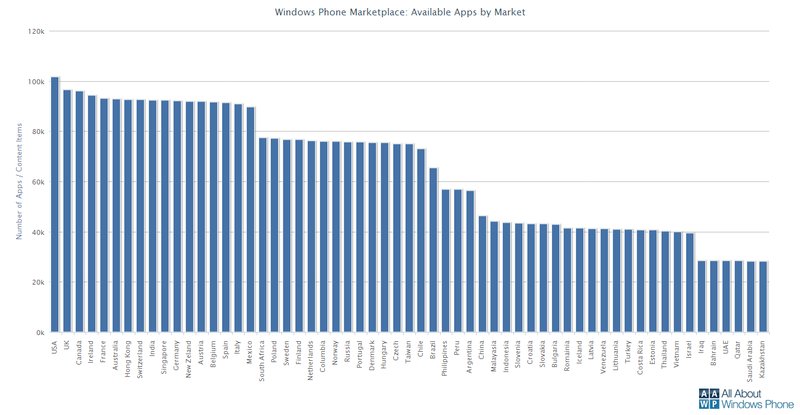 In September, the last full month for which data is available, an average of 215 apps were added to Windows Phone Marketplace per day. This was down from earlier in the year, but more than double the number from September 2011 2011 (97 per day). The app addition rate has fallen over the middle months of 2012, perhaps as developers look ahead to Windows Phone 8, but the overall trend sees an increasing growth rate from 2011 to 2012. In January, we started looking at how many times an app has been rated as a metric. This can be seen as an analog for quality since only applications and games seen as useful are likely to be downloaded and rated multiple times (spam apps will be ignored). In the UK Marketplace (total 96,265), just over 7,600 apps (7.8%) have been rated 5 or more times. This figure has been stable for most of 2012. For the US Marketplace the same figures are 77,450 and 14,031 (13.8%) respectively, up slightly from earlier in the year. Does 100,000 apps represent a psychological barrier at which point the number of apps stops mattering? That seems unlikely and, at the very least, the total app number is always going to be a footnote to any discussion about app availability. But perhaps it will matter less as app quality, functionality and discovery become more important. These metrics are harder to measure in a qualitative fashion, especially when making a comparison between app stores, so any app store that can create or promote a visible differentiator (e.g. app matching) may gain an advantage. The Marketplace has shown a steady increase in developers. 30,000 developers / organisation have now published an app in the Marketplace. 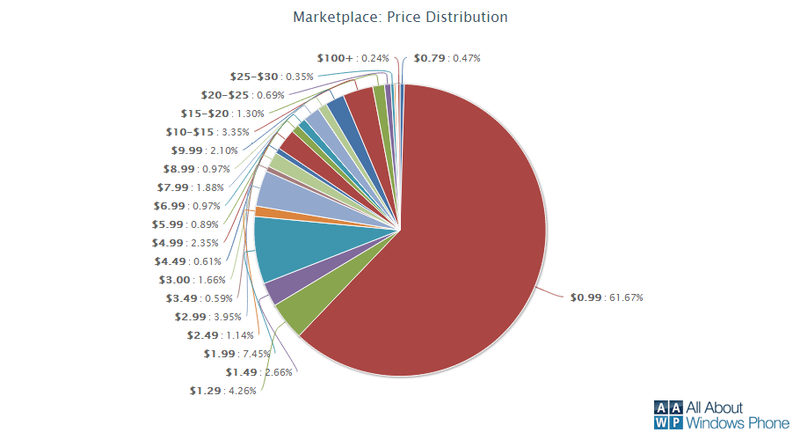 The chart below shows the proportion of content in each of the Windows Phone Marketplace's top level categories. Entertainment remains the the single biggest category (23,735 items). 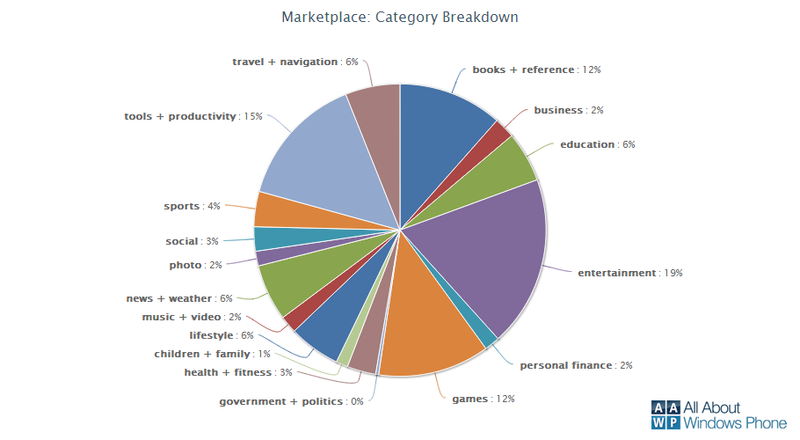 The next three biggest categories are tools + productivity (18,465), games (15,501) and books + reference (14,491 items). Of the top four categories, Games is showing the fastest growth having overtaken books + reference for third place since our May report. The four biggest categories (out of seventeen) make up 58% of the content. 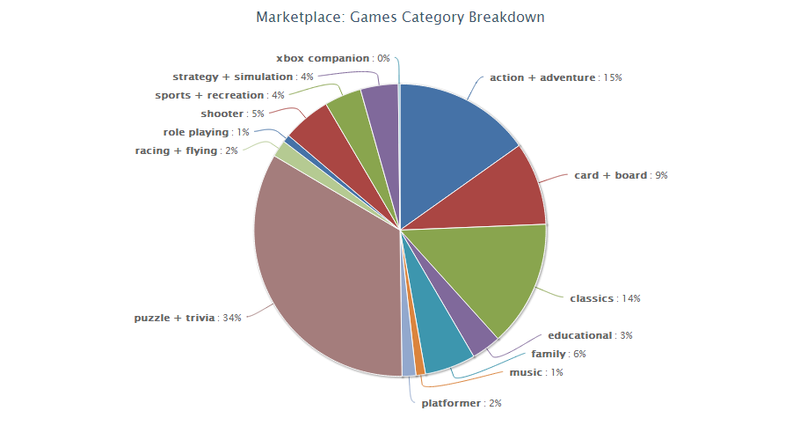 The pie chart below shows the breakdown of the game section by sub-category (in the Windows Phone Marketplace, games has the most sub-categories, by some distance). The most popular sub-category is puzzle + trivia (5,225 games - 34%), followed by action + adventure (2,354 games - 15%) and classics (2,160 games - 14%). 69% of items in the Windows Phone Marketplace are free, 10% are paid with a free trial and 22% are paid. In the last few months, there has been a small increase in the proportion of free apps, continuing the trend of the last 12 months. The wider availability of advertising SDKs for Windows Phone and an increasing willingness, by developers, to try ad-supported business models is the primary reason for this. The majority of paid apps fall into a few price points: $0.99 (61.7%) , $1.29 (4.3%), $1.49 (2.7%), $1.99 (7.45%), $2.99 (3.95%) or $4.99 (2.35%). There is a very slight trend of downwards price movement. Both Android and iOS have at least five times more apps available than Windows Phone. However, this metric is, for obvious reasons, strongly correlated to how long an app store has been in operation. A more interesting comparison is to look at their relative performance. Windows Phone has taken just over 24 months to reach the 125,000 milestone. Android took around 26 months (October 2008 - January 2011) to reach 125,000 apps, reflecting Android's relatively slow start in terms of device licensees. iOS took 18.5 months (July 2008 - August 2009) to reach the same figure. We've previously included Blackberry OS in this comparison chart, but it is not included this time as it has yet to reach 125,000 apps. The Nokia Store took around 26 months (but includes apps for both Symbian, Maemo and Series 40 platforms). Windows Phone has lost some of its advantage since we last looked at this metric in May. Moreover, Android enjoyed very strong growth just after its second birthday, accelerating rapidly between 100,000 and 200,000 apps. 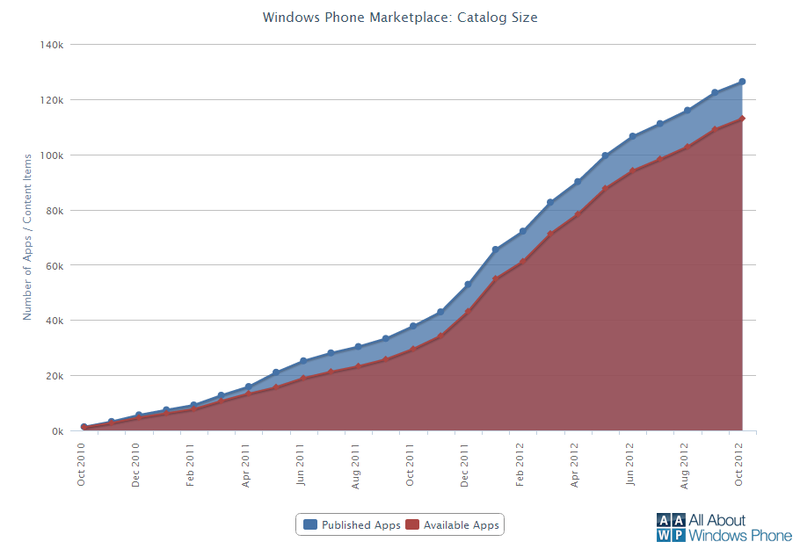 Windows Phone, by contrast, has been relatively slow in growing from 100,000 to 125,000 apps. Much will depend on developer acceptance and uptake of Windows Phone 8 if the platform is to maintain its current relative position between iOS and Android. These numbers are from our own tracking system, which is also used to power the All About Windows Phone Apps and Games sections, where you can browse applications and games, and install them via links to the web-based Marketplace, or directly by scanning the QR Code with Bing Vision on your smartphone. Every app available for Windows Phone has a unique App ID number (e.g. as used in the WindowsPhone.com links) and this is what we use track individual content items and keep count of how many unique apps are available for the platform.